Picture-perfect knits for you and yours. Swags of stitching—mini mittens, sweaters, birds and more—add yarny cheer to seasonal décor. Scene-stealing accessories to dress up your nights in glittering style. Plus-size jackets traverse the violet spectrum. Charming layette trios in the colors of the season. Knit a whimsical forest playland, where winged fairies frolic amid tulip-petal homes. What's new in our collective knitting bag. Intriguing reads for all the knitters on your gift list. The designer/blogger/author/TV personality talks about her new yarn line. This title can be downloaded to your Apple iPad, Amazon Kindle and Android Tablets. 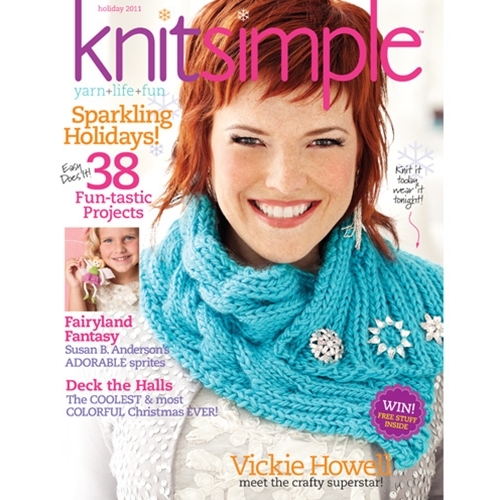 If you already have downloaded the Knit Simple Magazine App, you may purchase this item within the App. If you haven't downloaded the free app, click here to download.